SAF-HOLLAND sliding frame air suspension systems are perfect for on-highway van and reefer applications. They offer optimal performance, increased efficiency and trend-setting technology features. SAF-HOLLAND fixed frame air suspension systems are perfect for specialty and off-highway applications. They offer innovative technology, exemplary durability and superior performance features. SAF sliding frame mechanical suspension systems are designed specifically for maintenance cost reduction, weight savings and on-highway efficiency. 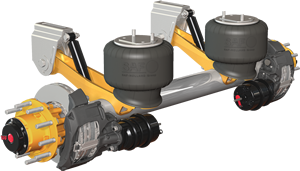 SAF fixed frame mechanical suspension systems are designed specifically for specialty and off-highway applications.